End-grain butcher block made from durable & unique Southern Yellow Pine. Finished with food-safe mineral oil and buffed with beeswax. LARGE - 16 x 13.25 x 1.75"
MEDIUM - 13.25 x 8 x 1.5"
SMALL - 8 x 6.75 x 1.25"
Serving board / cutting board featuring circular hand cut inlays. Each board varies slightly as each piece is handmade and one-of-a-kind. Available in Walnut, Cherry, Maple, Beech. 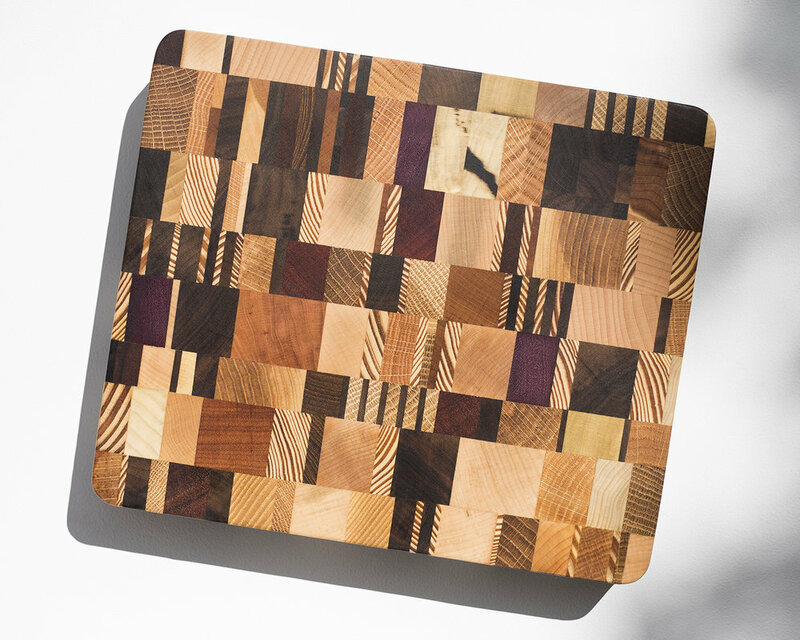 Cutting board featuring stripes of various types of wood. 11.75 x 11.75 x 1.75"
End-grain butcher block featuring extra-detailed pattern with lift handles on sides. Available in White Oak, Poplar (picture to come). LARGE - 19.25 x 13.5 x 1.75"
MEDIUM - 12 x 11 x 2"
End-grain butcher block made of maple. 13.75 x 9.5 x 1.5"
End-grain butcher block made of various types of wood. LARGE - 16.5 x 11 x 1.75"
MEDIUM - 11.75 x 10 x 1.5"